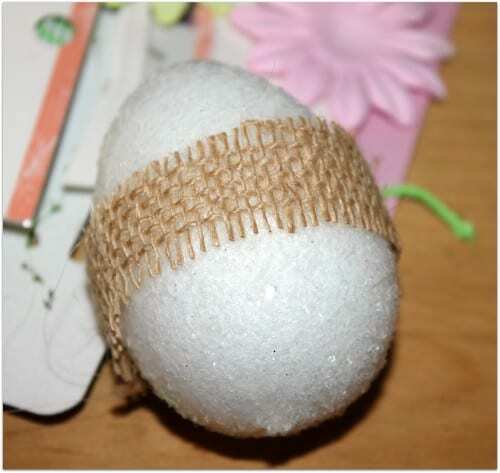 Let the kids help as you learn how to make easter eggs decor with glitter and burlap. 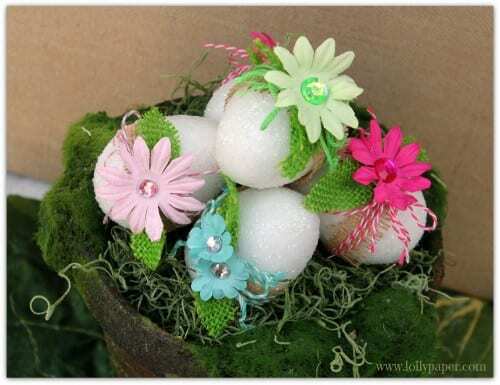 A fun craft idea perfect for your Easter Celebration! I started this project with a package of foam eggs I found at the dollar store. These little guys are great because the inexpensive and the possibilities are endless! Now I wish I had bought more! 🙂 You can never have too much in your stash, is what I say! First, start with your eggs. 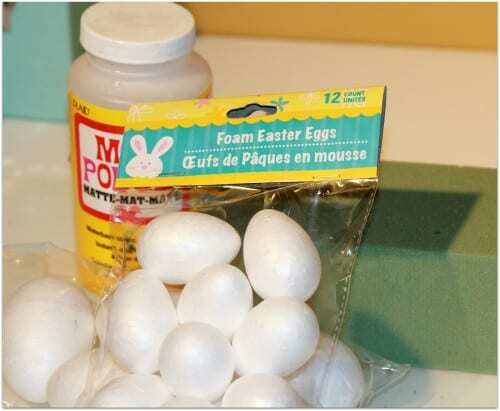 If you don’t have a dollar store nearby, you can go to any craft store and pick up any egg-shaped material. I’ve seen them in paper mache and a heavier styrofoam material. I like these because the price was right! 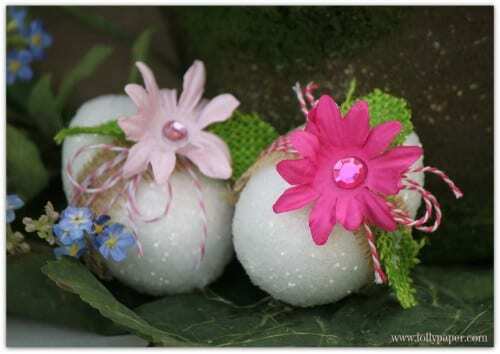 First, you want to take a small piece of floral wire and insert into the bottom of your egg as a “handle”. You could also use a toothpick or any other item that is narrow enough that it won’t make too big of a hole in your egg. 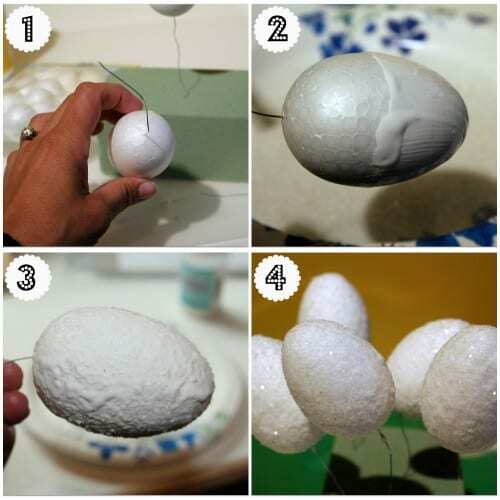 Give your egg a nice coat of glue (I applied mine with a small foam brush) and then sprinkle with a coat of glitter. 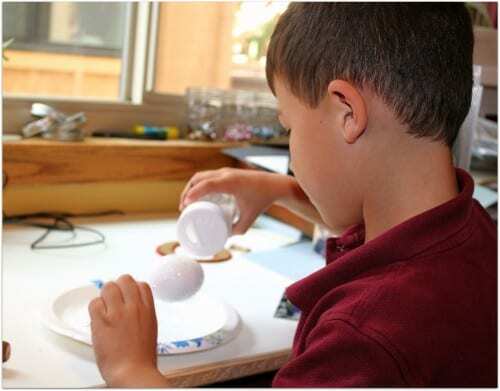 Once your first layer is dry, apply a second layer of glue over the first. I find that a second layer hides any of the underneath surface and gives the project a nice thick coat of glitter. It looks messy and not so pretty at first, but trust me, once it dries, you will be happy with a second coat! I used a block of floral foam to hold my eggs during the drying process. I didn’t want an egg with a flat side! Next, I took a few scraps of burlap from another project and cut it down to fit around the egg. Yes, literally scraps…you don’t need much! Next, I cut a little oval, about 1 inch, out of green burlap. I put a bit of hot glue down the middle (only half way) and pinched. TIP: use a low heat glue gun! You will be in lots of pain if you do this part with a hot glue gun! Trust me on this! 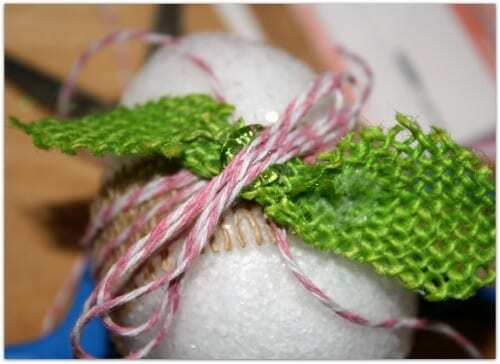 Next, wrap your egg with a colored twine or thread, and make some loops. Then glue on leaves, twine, a paper flower (you can get at any craft supply store) and of course some bling. If you don’t have paper flowers, you can use artificial flowers (silk), dried flowers, or even a ribbon flower, etc. Be creative and have fun! Here are some pictures of the finished product. Hope you enjoy! How do you decorate for Easter? Share and leave a comment below! 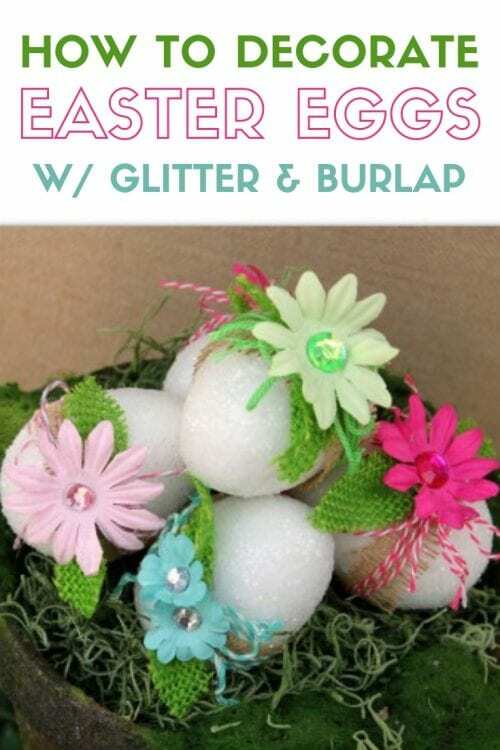 SAVE HOW TO DECORATE EASTER EGGS WITH GLITTER AND BURLAP TO YOUR FAVORITE EASTER PINTEREST BOARD! I, too, how will these items look together – but they are beautiful eggs – so SPRINGY! 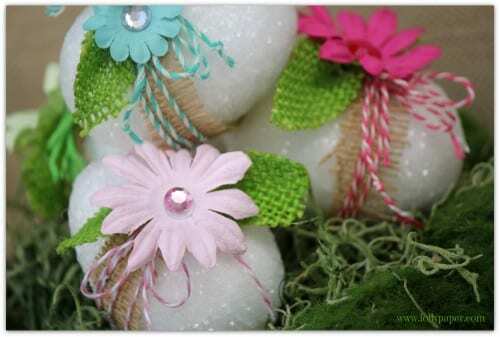 A perfect idea for decorating for Easter or a Spring Tea Party! TFS the wonderful photo tutorial! Oh these would be perfect for my Easter dinner table! Love that your children helped you. 😉 I’m so excited to see your project on Show-Licious Craft & Recipe Party! Thanks for linking up with us! Your glitter eggs are lovely!